Aphrodite Slim Pro is not just a lighter version of its sister Aphrodite Pro. Aphrodite Slim Pro has duplicated the quantity of characters of its partner, and that means more than 500 new glyphs, reaching a total of more than 1000. 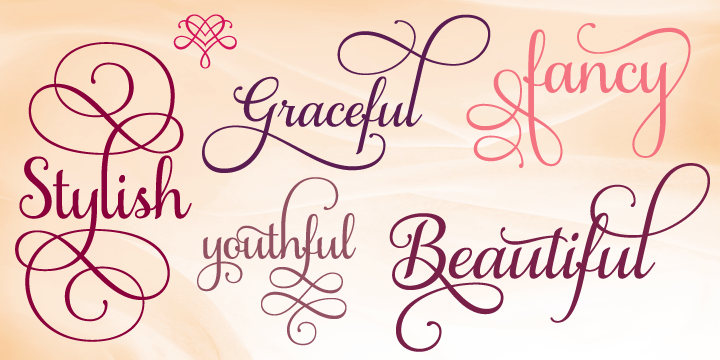 More delicate and meticulous, Aphrodite Slim Pro is once more a new typography with deep calligraphic ideals: We immersed ourselves into the world of each calligraphy ductus and each calligraphy masters by studying from decoration to lettering books. Reina is Sproviero’s didone of the year. We recommend seeing its user’s guide. It was created with Brides and Invitation Designers in mind, though it is a great choice for any project seeking a custom hand lettered/flourished look. As I began sketching out this font, I was drawn to the idea of creating it with classic proportions, and as it developed, it took on an old-style Victorian look, yet with a touch of modernity and friendliness. 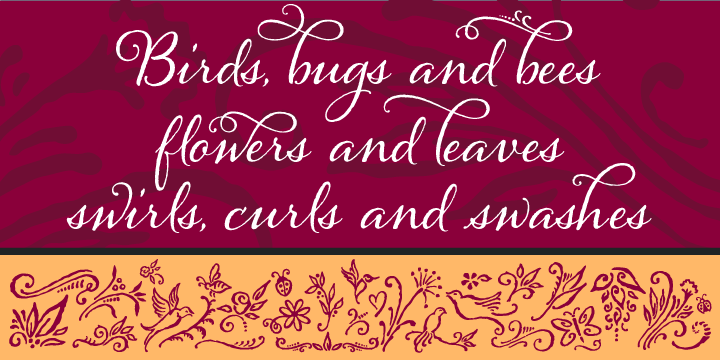 Yana is a growing family—I will be adding bold, italic, and antique versions, more alternates…even decorated initials! 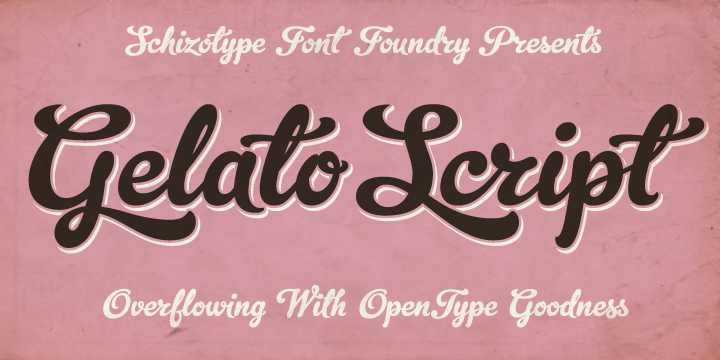 Gelato Script is a smooth-flowing typeface with an air of familiarity. 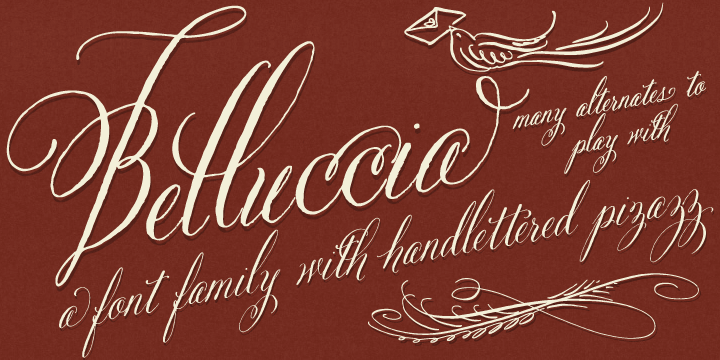 Influenced by both formal scripts and mid-Twentieth Century hand lettering. The power of OpenType is used with precision in the Contextual Alternate feature to make sure letters connect seamlessly, t’s cross where they can and swashes don’t crash into neighboring glyphs. 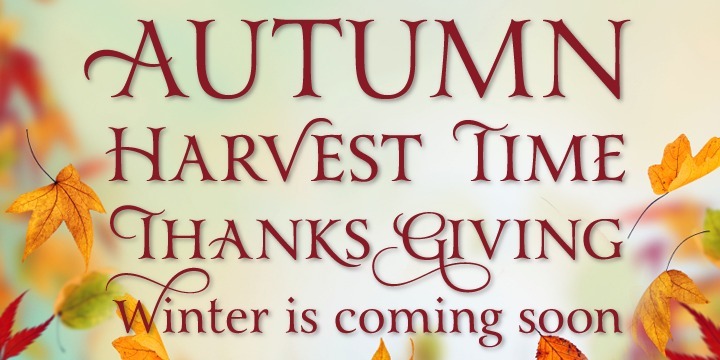 781 glyphs make up this font, which is capable of speaking in many different languages. Samantha was designed with a focus on variety, versatility, beauty and practicality. 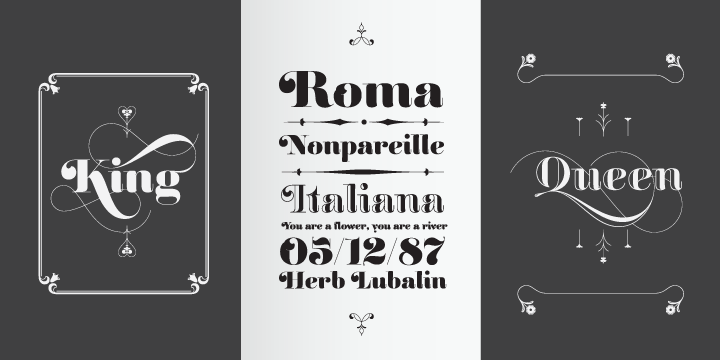 With measured rhythm and contrasting, connected strokes, Samantha possesses a flowingly smooth elegance with the ability to take on many appearances, from simple styling to the fanciest of all flourishes with its 2700+ glyphs that take advantage of OpenType. Over 1100 alternate and swash letters feature ascenders and descenders that vary in length and complexity. Standard ligatures ensure that this font looks as perfect as possible and 20 discretionary ligatures enliven its style. Numerals are offered in their standard form, as well as an old style and a swash set too. The addition of 60 ornaments and 45 catchwords offer even more design possibilities. A detailed User’s Guide is available in the MyFont’s Gallery. This in turn echoes the concept of the clean brush scripts found in the different film type processes of late 1960s and early 1970s. 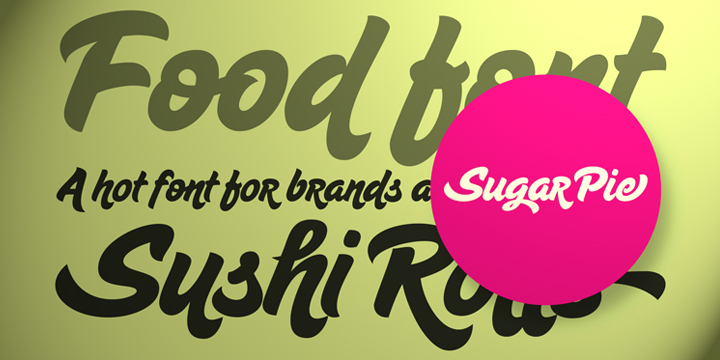 While Candy Script’s main visual appeal counts on the loops, swashes, and stroke extensions working within a concept of casual form variation, Sugar Pie is artistically a straight forward packaging typeface. Its many ligatures and alternates are just as visually effective as Candy Script’s, but in a subtler and less pronounced fashion. The alternates and ligatures features of Sugar Pie contain quite a few nice variations on the main character set. Use them to achieve the right degree of softness you desire for your design. Alana Pro is a natural looking, semi-connected script face. Based on hand lettering, friendly and unique with its ability to transition from casual to formal, it holds its original hand drawn, slightly rough look and feel. It features 341 alternates which include two additional uppercase letter sets and hundreds of alternate lowercase letters, making it very versatile. 62 whimsical ornaments, designed especially to coordinate with Alana’s style, are offered separately and are also included in Alana Pro. Alana is named after and dedicated to my darling little sister. After the success of Aphrodite Slim (One of MyFonts’ best fonts of 2009, which was co-designed with Maximiliano Sproviero) Typesenses presents Parfumerie Script, designed by Sabrina Lopez. With more than 2500 glyphs, Parfumerie is unique amongst the others in its style because it is based on the author’s calligraphy. One of its variables is a Decorative option which combines Copperplate Calligraphy with an ornamental form native of Buenos Aires (where Sabrina lives), the ‘Filete Portenio’, which makes it look original amongst the other fonts. 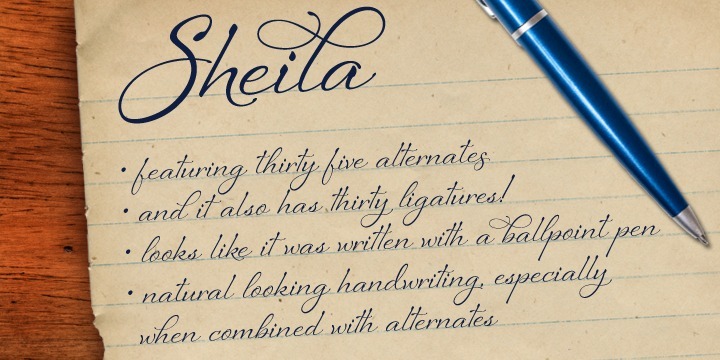 Sheila is so much fun, and has excellent handwriting! She loves to write notes and letters, create headlines and subtitles – just about anywhere! She writes very deliberately, focusing on each letter form, trying to make her writing, and your designs, look as good as possible. Sometimes, Sheila likes to switch it up with her alternate letters, and she keeps some of her fancy lettering from getting too out of hand by using ligatures.